Most depictions of LGBT history tend to focus on the “G,” and often center around events and people from New York or San Francisco. But lesbian, bi, and transgender women have played an integral part in the movement—especially here in Los Angeles. In the 1990s, street activism was playing out alongside newly formed organizations dedicated to more white-collar ways of approaching equality. 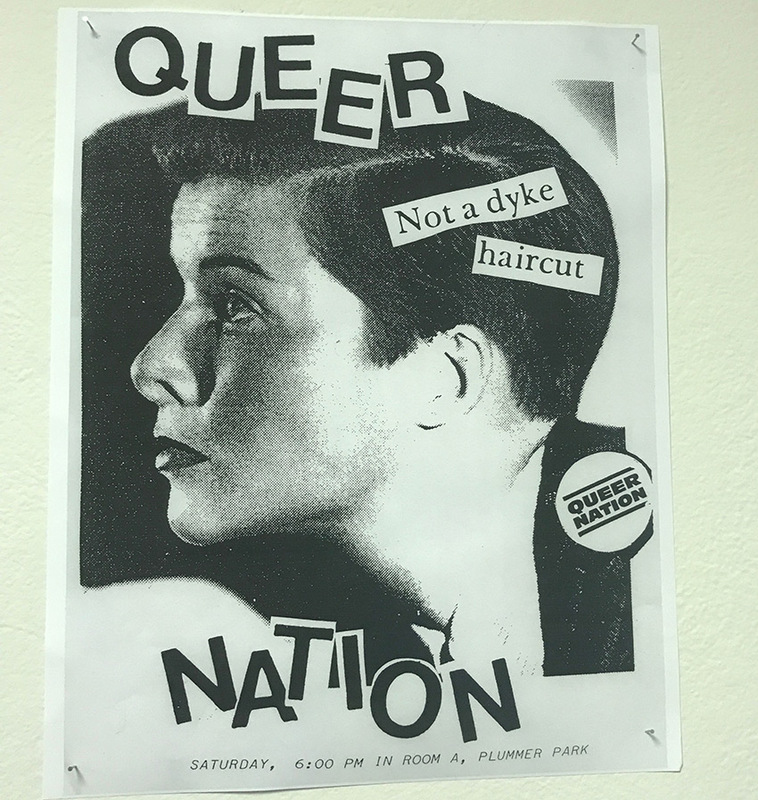 Queer women were getting arrested for demonstrations as part of national groups like ACT UP and Queer Nation, having their parties raided, and seeing their public art censored. Now, a new exhibition in West Hollywood’s Plummer Park celebrates this forgotten history. Lesbians to Watch Out For: ’90s Queer L.A. Activism highlights the people, locations, protests, art, publications, and passion that led to so much LGBT progress in the city and nation. 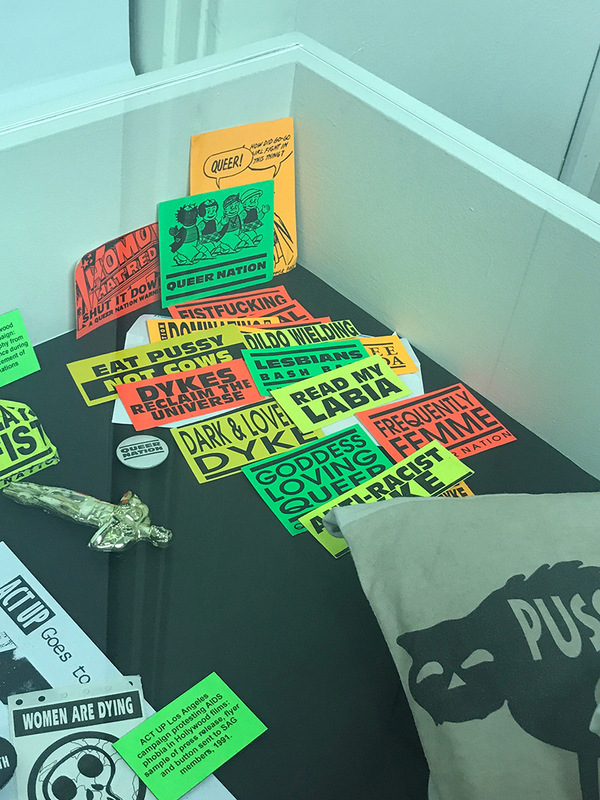 Held in Long Hall, which was once home to early ACT UP meetings, the free exhibition opened this past Friday. Several activists joined attendees, who learned about the experiences of long-time community organizers like Judy Sisneros, who is one of the creators of the show. 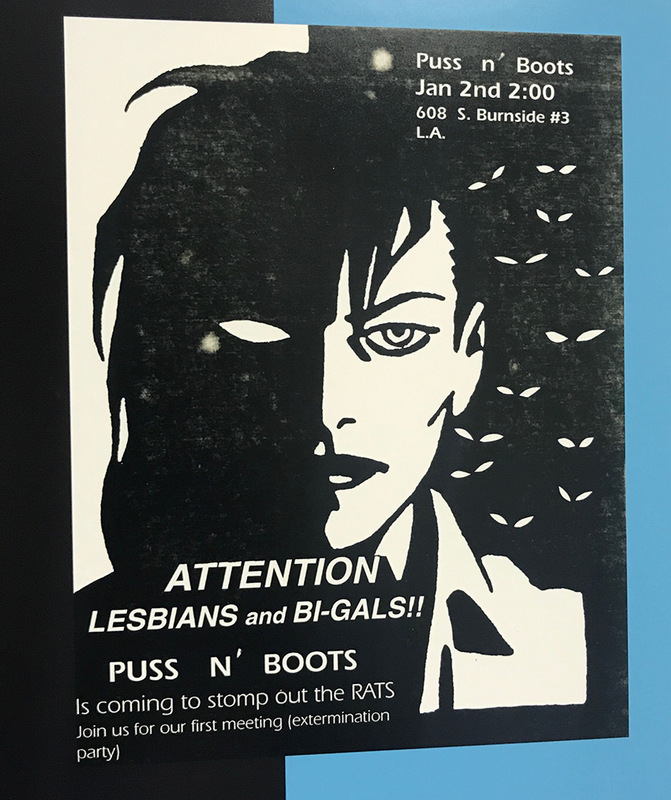 Along with Lynn Harris Ballen, an early LA Dyke March organizer who now produces and co-hosts Feminist Magazine Radio on KPFK 90.7FM, Sisneros was first approached to host a 25th anniversary exhibition of the Lesbian Avengers. The Avengers, a ’90s group of lesbian and bi-identified women who created demonstrations for queer visibility, organized the first Dyke March as part of the 1993 March on Washington. The hope was that the Lesbian Avengers exhibition would travel from New York, where the Avengers held most of their actions. Puss ’N’ Boots advertised bi-monthly meet-ups in the basement of Silver Lake’s Grassy Knoll coffee shop. Their tagline was “We’re out…on the street… and we’re unstoppable!” Sisneros said that while she was happy to help host the Avengers exhibition in Los Angeles, she also wanted to make sure that the city’s own herstory would be remembered, too. As part of the City of West Hollywood’s One City One Pride LGBTQ Arts Festival, Lesbians to Watch Out For features local women who were a part of larger national organizations, as well as more community-based groups like The United Lesbians of African Heritage, Lesbians Unidas, Los Angeles Asian Pacific Islander Sisters, Transgender Menace, and BiNet. Both women have theories as to why Los Angeles is too often ignored when it comes to LGBT history, and it largely has to due with accessibility. Perhaps what’s most striking about Lesbians to Watch Out For is just how much queer women were able to accomplish at a time when mobilizing was dependent on word of mouth. Sisneros and Ballen worked in collaboration with the June Mazer Lesbian Archives & LEX – The Lesbian Exploratory to make sure their time capsule reflected the diversity of the period, since not all of the work was taking place in the gayborhood. The “Spaces” section of Lesbians to Watch Out For highlights the venues—bars, clubs, cafes, bookstores, and other community hangs—where activist lesbians and allies would hold meetings, benefits, or other outings. Some of these places, like Little Frida’s, Jewel’s Catch One, and a Different Light Bookstore are now defunct—a sad reminder of how much the community has lost. 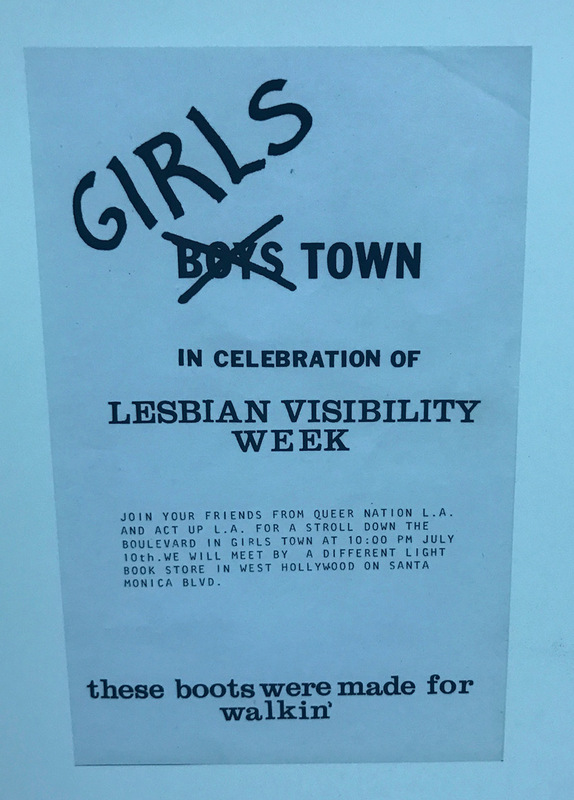 It does, however, offer Angelenos the opportunity to learn about and celebrate how the city’s LGBT women gathered to further the gay movement by doing things their own way. And, hopefully, inspire some new generations. “You have to remember that these stories that you see, there’s more stories tenfold behind them,” says Ballen. Lesbians to Watch Out For is on view at Long Hall in Plummer Park on Fridays 6 pm – 9:30 p.m., Saturdays & Sundays 1 p.m. – 6 p.m. from June 15 – June 30. Admission is free.